After receiving a Birchbox subscription as a gift from a friend at Christmas, I have become slightly obsessed with the idea of the beauty box - they are appearing everywhere at the moment which is not great for my bank balance. 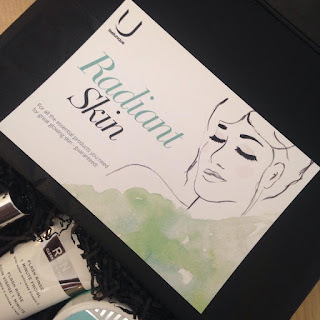 Last month I had a Feel Unique voucher - one of the Groupon ones - and after a lot of scrolling through pages and pages of products, not coming to any conclusion what to spend it on, I decided to buy their Radiance Beauty Box as it comes with a few products that I've been really keen to try recently. It was £35 (with a value of £70.50), and it contains four products that are targeted at enhancing the radiance of your skin. One of the reasons I bought this box is that I've been really keen to try this spray out after continuously seeing it on other people's reviews and favourite posts. It is the prettiest little bottle and the spray itself smells really fresh. I tend to either use it in the place of a toner or after I have finished my make-up, as I read it was a good setting agent. I have had it for a month and it has barely gone down which is great. I am not going to say that I can't live without this as when I forget to use it I don't feel like my skin is that much different, but when I do remember I really like using it. Now I've tried these out I can really see why they have been so popular. They come in a really cute little tub-type packaging, with a pile of pads inside. I usually use them after I have taken my make-up off and before I moisturize, as they act as a toner/exfoliating-type product. What I like most about them is that they are such a gentle exfoliator - so gentle that you can barely feel it doing anything to your skin - but after I have used it my skin feels so much smoother. Liquid exfoliators with the microbeads etc can really dry out my skin so this is a great alternative. As you only need to use them once a day they have lasted quite a long time, I think they are quite good value. I would definitely consider repurchasing after they run out. REN is a brand that I really like, I have tried a few products from them before which have been great but the hefty price tag of products that are not really essential (such as this facial mask) have deterred me from trying ones like this. Saying that, I am so glad I got to try this out because it is amazing and unlike any other face mask-type product that I have used before. It is a bit of an alarming colour and texture when you first squeeze it out, green and slodgey is not what I was expecting. You are advised to put it on your face for one minute, massaging it in your skin in circles which is meant to release the Vitamin C in the formula. The texture changes as you rub it in which is also quite a strange sensation, it slightly solidifies as it sets on your skin. I use it quite sparingly as I am very aware it's an expensive product - not the kind of thing you'd use everyday - but a little bit goes quite a long way and you can just use it on your T-zone to make it go further. Once you wash it off, your skin does feel a lot silkier and smooth. By the next day I have really noticed a difference in tighter, fresher skin. I can see why it has been included in the Radiance box as it that is exactly what it does. Although it is only 15ml I wasn't expecting it to be quite so small, it is a travel-size product really so it is one of those things that I will have to use on special occasions infrequently to make it last. I have seen it reviewed quite a lot but the full size (50g) is £40 which is way out of my price range for a product like this. However, you can tell why it is so expensive as it works really well, leaves skin soft and clean. It does tingle when you first apply it to your skin but I like to think that means it's actually making a difference. It really enhances the glow of your skin, but I am unsure to whether I prefer this one or the REN 1 Minute Facial but they give similar results. 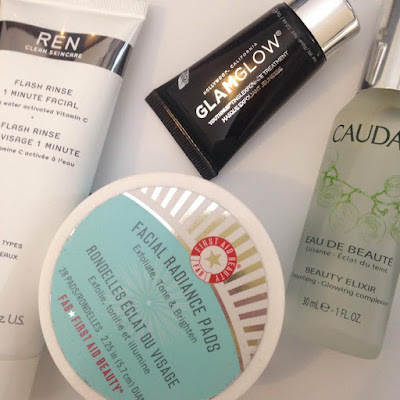 The beauty boxes are such a good way of trying lots of products that you wouldn't necessarily buy individually - the Glamglow YouthMud is a perfect example of this as it is definitely not something I would buy on a whim to test it out. 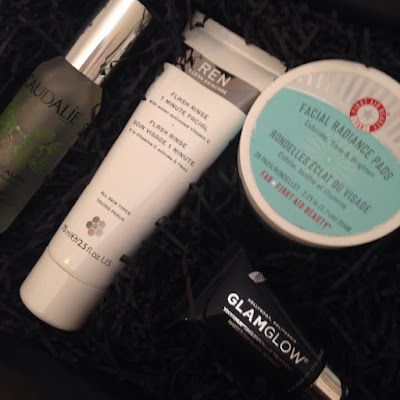 What a great box, these are all products I love or have been wanting to try! This is such a great box. I'm curious about the Glamglow! I love the facial radiance pads! If I use them one night, it looks amazing the next day!